The event, coming one day after the fatal attack in Pittsburgh, includes officials from the Anti-Defamation League. 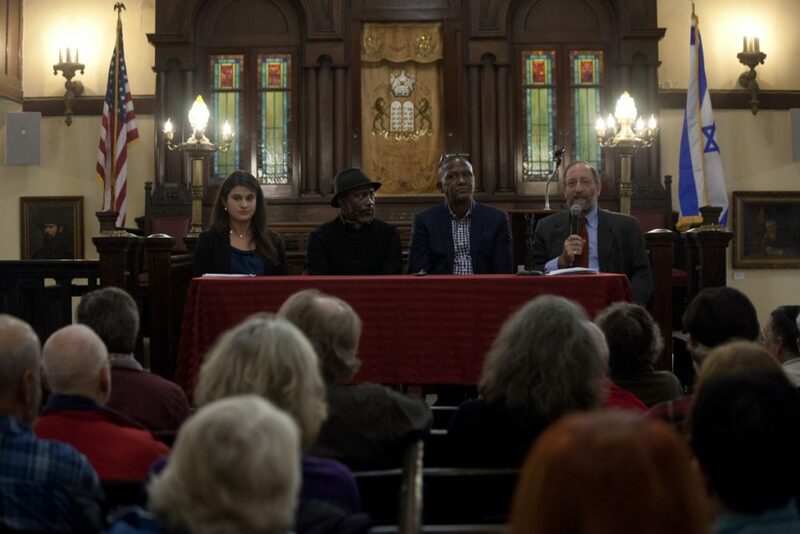 In the wake of the Pittsburgh synagogue shootings, a discussion on immigration Sunday in Portland took on special meaning. A Portland police officer greeted people as they entered the synagogue. He remained on duty throughout the event. The forum, which was moderated by Rabbi David Fox Sandmel, director of interreligious engagement at the Anti-Defamation League, was designed to tell the story of migration from several perspectives. Though the fatal shootings Saturday of 11 people at the Tree of Life synagogue in Pittsburgh by a man reportedly shouting anti-Semitic slurs were not the focus of the discussion, the attack was on people’s minds. “Yesterday’s tragedy and the apparent hatred that motivated the perpetrator really hit home with everyone,” said Amy Feinman, the Northeast area civil rights counsel for the Anti-Defamation League. Feinman’s presentation focused on the ADL’s legal challenge to President Trump’s travel ban, which excluded people from several Muslim-majority countries from entering the United States. She also provided an update to the legal challenges involved with the administration’s zero-tolerance policy, which separated migrant children from their parents when they tried to cross the southern border. Feinman said the political turbulence over immigration and bias toward people from other countries that America is experiencing now is not new. She said the country has gone through up-and-down swings in its treatment of immigrants. In 1942, Feinman pointed out, the United States, citing national security concerns, placed 120,000 Japanese-Americans in internment camps. It wasn’t until 1980 that the U.S. government issued an apology to those individuals. The Washington Post said the man charged in the Pittsburgh shootings, Robert Bowers, used social media to rail against Jews and refugees. The other panelists Sunday included Pious Ali, the first African-born Muslim elected to Portland’s City Council, and Damas Rugaba, an immigrant from Rwanda. Ali spoke about his journey as an immigrant from Ghana and his work at the University of Southern Maine’s Muskie School of Public Service. Rugaba is co-founder of the Greater Portland Immigrant Welcome Center. He spoke about integrating immigrants into Maine’s economy.